I must admit that wallpaper is one of my biggest design weaknesses... it gets me so excited and happy when I am able to use a beautiful, impactful wall paper as a feature wall in a room! I love getting new books and be completely daring. It is definitely an element in which i am able to help my clients step outside of their comfort zone and are ever so happy they did when they see the end results. Wallpaper can have multiple purposes.. It can be used for texture: Usually wh en the goal is to use wallpaper as texture, the colours will be more soft as a backdrop, to add an extra dimension to the space and interest. It can be bamboo, metallic, velvet, leather, crackles, linen etc.. there are all kinds of cool and different textures available. It can be used as a dramatic focal point: If used for drama, it will either be bold and strong in colour or in pattern or sometimes to the extreme in both!! It all depends on your comfort level and what you are trying to achieve in the space. Something elegant or dramatic, an unforgettable statement etc.. Busier patterns can be geometrics or what I love the most are damask shapes in either soft greys or bold dark blacks or turquoise! 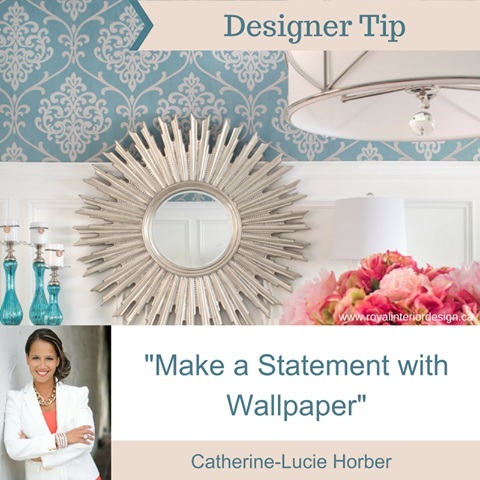 How to use wallpaper: What scares people when they hear wallpaper is the image they get of their grandmother's house where all the walls were plastered in bold vibrant florals!!! The trick is to use it carefully and very strategically. If the pattern is bold and busy, then I usually put it on ONE wall only or if I want to put it all around a room, I'll break it up heavily with clean white solid trim work at the bottom to offset being so busy. If it is light and elegant, then I love putting it on all walls like a powder room. Depending on the texture, colour, pattern, of the wallpaper, its application will differ. Much like fabric, wallpapers can be a source of great inspiration for design. No matter how it is chosen to be used in the space, it is important that it is planned carefully and used to create the impact it is intended to.